Mumbai: The volatility in Indian stocks in the past few weeks is expected to impact the valuations of small and medium-sized companies that are preparing to launch their initial public offerings (IPOs). Since 2015, a majority of the 94 companies that have launched IPOs for listing of their stocks on the main boards of exchanges are small and medium-sized companies, data from stock exchanges shows. In the secondary markets, small-caps and mid-caps have been the biggest losers in the recent months, resulting in depressed sentiment for IPOs from these segments, industry experts said. 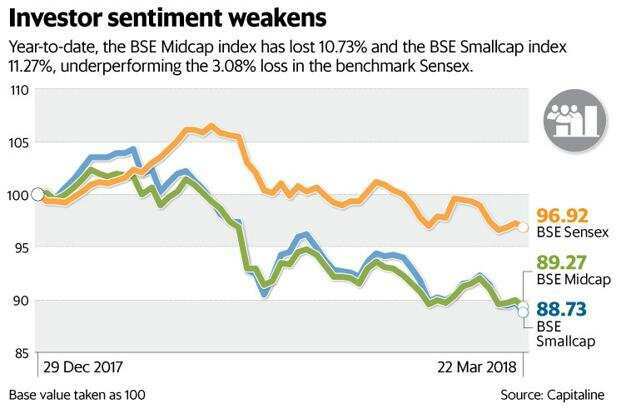 Year-to-date, the BSE Midcap index has lost 10.73% and the BSE Smallcap index 11.27%, underperforming the 3.08% loss in the benchmark Sensex. “The mood has been down in the last couple of weeks in the secondary markets and the political economy is also not looking very good. So sentiment is weak and that will definitely impact valuations," said Prithvi Haldea, chairman of primary market tracker Prime Database. Haldea added that people were willing to pay for stretched valuations when the Sensex was rising from 28,000 points to all the way up to 35,000-36,000 points. “But now due to the fall in the stock prices of your peer group, your valuation will also take a hit," he said. The post-listing performance of recent IPOs in this volatile market has also been a mixed one, adding to the softening of sentiment. Of the six companies that were listed since January, three are trading below their issue price. These include Aster DM Healthcare Ltd, Newgen Software Technologies Ltd and Apollo Micro Systems Ltd. According to industry experts, given the prevalent market conditions some small- and mid-cap companies could even face difficulties in launching IPOs. “People have disproportionately lost money in small and mid caps. People who started marketing their transactions two months back, the valuations then and the valuations in the secondary market today are starkly different. So a lot of small- and mid-cap deals will face pressure in launching given the gap between promoter’s valuation expectation and what investors are willing to pay," said an investment banker working on several IPOs. He requested anonymity as he is not authorized to speak to reporters. In these markets, investors would prefer investing in existing stocks in the listed universe rather than new ones coming in the IPO market, and thus small- and mid-cap companies going for IPOs will have to offer higher discount on valuations, he added. Companies and investors can expect volatility to continue given the several state elections that are slated to happen later this year and the Lok Sabha election due next year. “This being an election year, government will go in election mode and governance will likely take some hit. We have three to four big state elections this year. So there is nervousness in the markets at this point of time," said Haldea of Prime Database.